Adding a certifying signature to a PDF means you are the author of the document, have finalized its contents, and want to secure it against tampering after it has been distributed. Certified documents display a blue ribbon across the top of the document containing the signer's name and the Certificate issuer - a clear, visual indicator of document authenticity and authorship. Healthcare Industry: Prove the origin of confidential reports and ensure they cannot be altered after distribution. Architecture/Engineering/Construction Industry: Protect your intellectual property by making sure no one can make any changes to your drawings or plans after publishing. You can also choose to include your Professional Engineer seal as part of your signature. In addition, many State Departments of Transportation and other regulating bodies now require digital signatures for electronic document submission. Any organizations implementing electronic workflows around sensitive or proprietary documents, where preserving document origin and integrity is necessary. 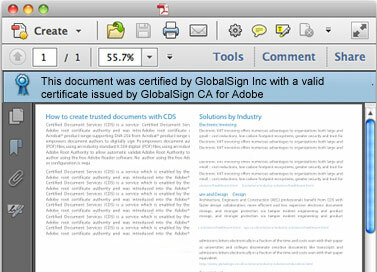 GlobalSign is an approved member of Adobe's Certified Document Services (CDS) program and our PDF Signing Certificates are transparently trusted by Adobe Acrobat. This means once you receive your Certificate you can immediately begin certifying and digitally signing PDFs, without the need to install any additional software or plug-ins. Adobe Reader's simple to interpret "Blue Ribbon, Yellow Warning Triangle, and Red X" messaging allows even novice users an easy to understand method to determine if the document is legitimate. GlobalSign partners with Seiko for timestamping so the date and time are captured each time you sign a document, providing the unarguable evidence essential for time sensitive transactions and audit trails. Organizations interested in implementing a secure PDF Signing solution should look no further than the cost-effective, easy-to-use EnterprisePKI (ePKI) to manage multiple PDF Signing Certificates. In addition to offering significant savings over purchasing individual PDF Signing Certificates, ePKI allows for full certificate lifecycle management. Administrators can easily and efficiently issue, renew, reissue, and revoke PDF Signing Certificates all from one cloud-based platform.